A badly handled crisis is one of the greatest risks to any organisation’s reputation. Yet while crises can’t always be avoided, they can be managed – for better or for worse. That’s where well-prepared communications professionals are worth their weight in gold. A good crisis plan, thoughtfully prepared and skilfully executed, can stop a crisis becoming a catastrophe. 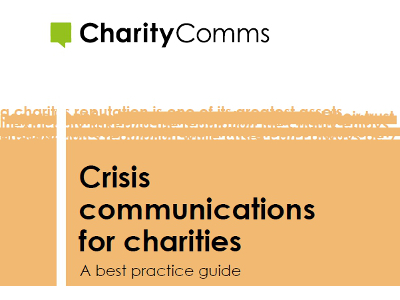 Working with independent comms consultants Champollion and a steering group of experienced and battle-hardened comms experts, CharityComms has produced a free practical guide to creating and implementing your own crisis comms plan. The guide explores how to identify a crisis and what a successful crisis comms response looks like. We talk you through preparing for a crisis, understanding staff roles and involvement, what to do when the crisis hits and dealing with the aftermath. Our spotlight on media tells you how much to say and when, and advises on using social media to help, not hinder, your comms activity. We can’t stop crises from happening. But we hope this guide will help you be prepared for when they come. Download your free guide now.